Pasighat police of Arunachal Pradesh arrested one drug peddller and recovered suspicious drug items including Brown sugar from his possession. The arrested drug peddller identified as Edi Gogoi (29 ) is from Namsing village and is to be selling drugs in Pasighat and Aalo area. 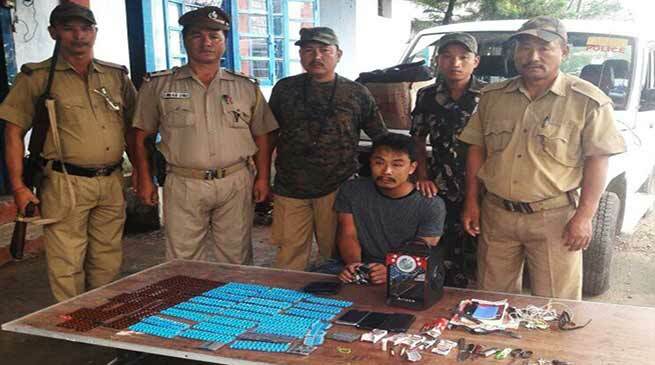 According to police sources while in their routine Inner Line Permit checking at Ruksin check gate, entry to East Siang along Arunachal-Assam boundary on Sunday, the Ruksin police found a youth named Edi Gogoi carrying suspicious drug items in a bag when Tata Sumo bearing registration number AR-01J-5480 coming from Itanagar-Banderdewa was checked. On thorough checking, the police found 1 small plastic bottle weighting 2grm. 800 mlgrm. Suspected to be containing brown sugar, 576 nos of spasmo proxivon capsules, and 38 nos of nitrosun tablets from his possession . During police interrogation, Gogoi revealed that he along with four other peddlers used to go outside Arunachal Pradesh to collect brown sugar and capsules on rotation wise and use to sale the same here at Pasighat, Mebo areas etc, informed police.